Creating beautiful and compelling imagery through the medium of photography is a difficult challenge. Capturing a scene as it unfolds is both art and truth in storytelling. 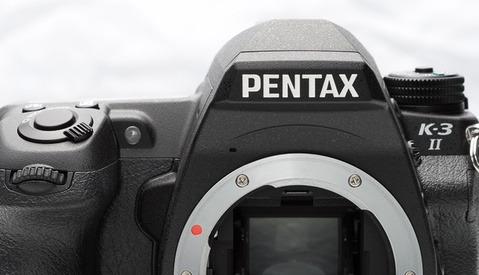 Today, digital photography presents the effortless platform for image capture. Excelling technology allows anyone to pick up a camera and take excellent photographs. One might say the ease of digital imagery has opened doors across platforms. We’ve seen this paradigm before; we witnessed the introduction of gateway tools in the world of photography since the dawn of the medium, each time bringing in new and excited enthusiasts who will go on to redefine what it is to be a photographer. 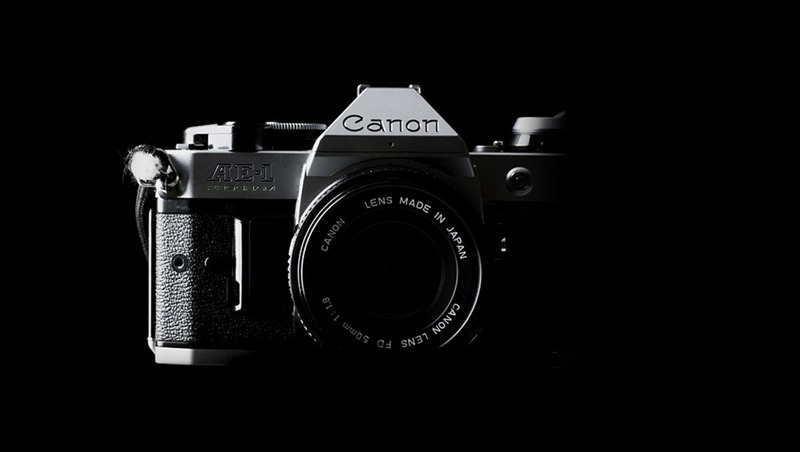 In 1981, well before the surge of digital technology, there was a camera that similarly ushered in a generation of photographers: the Canon AE-1 Program. Compact beauty and simplicity. The AE-1 Program has all the components of a proper SLR packed tightly into sleek and stylish package. An upgrade from earlier models, the Program offered fully automatic modes. The auto settings greatly make this camera an attraction for street photographers and shoot-from-the-hip enthusiasts. It is sleek and beautiful, lightweight, and (let's be honest) stylish. Packed with a 50mm lens and your shots compose themselves, giving you the opportunity to actually be in the environment. Rather than firing away 1,000 photos to be edited later, you can watch a situation unfold and raise your camera only at the time when you feel it is ready to be captured. The auto settings give you the ability to think less about mechanical composure and more about artistic composure. I’m a proponent for using manual settings (often saying auto settings can be leaned on but never relied on), but I’m also a sucker for having to work less to create beautiful images. 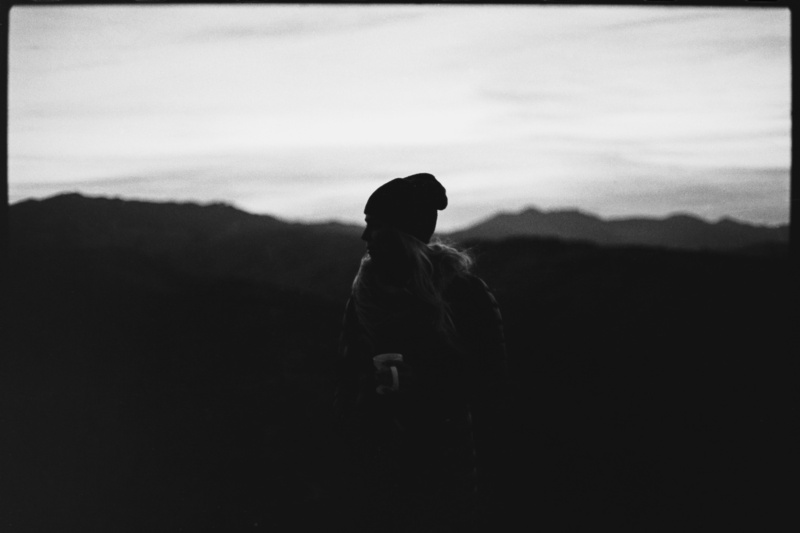 The AE-1 Program is so incredibly simple and capable. The necessary skill level required to operate this camera is broad, perhaps why this is the most popular camera for photography students. It is one thing to marvel over the technology of the AE-1P, however understanding drama of this model takes a look back at photography’s history. Set your time machine for 1981. There were many great cameras, but Canon was low on the list when it came to groundbreaking technology. There was Leica and Nikon as the big boy 35mm cameras. 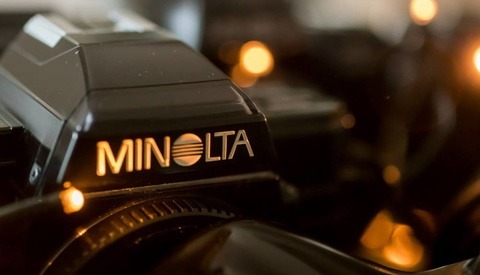 Olympus, Minolta, Pentax, and Canon were coming up closely as consumer-level equipment. Sure there were standout characteristics of each, and many began to break apart in their eventual pursuits. The point to be made is Canon was just another contender in a pack of camera companies. Canon had the Canonet, a popular rangefinder point-and-shoot, and the 110 series cameras as their popular consumer candidates. Aside from those they had the A-series cameras to offer up. The A series was a growing category honing in on the automatic/program technology. Canon was beginning to develop highly accurate metering technology that was allowing for automation like no other. There were plenty of amazing cameras on the market, but there was little in the way of competition for full-auto in the market. Nikon had just released the famed F3 that offered aperture priority with stepless shutter, but nothing quite at the level of the AE-1 Program. The camera was ushering in a new type of shooter to the professional level 35mm camera. Whats more, the original AE-1 and the cameras to follow (including the AE-1 Program) would be manufactured using automated technology, a huge contributor to the drop in price for high quality 35mm cameras. Price for a new AE-1 Program in 1981 was around $700, roughly $2,000 in today’s market. Not a bad price for a fully-automatic SLR. It was half the price of a new Nikon F3, widely considered to be one of the best high-end SLRs on the market at the time, if not ever. The lenses for Canon A-series cameras used the FD mount system. There are many lenses available out there, but there are really only a few you worth paying attention to. Chances are, if you’re shooting with an AE-1 Program, you’re in film school, taking a photography class, or just have an appreciation for analog photography. In whatever case, you’ll want to gravitate towards the three primes: 35mm, 50mm, and 85mm. There are some wide angle options that are pretty nice, but the 50mm f/1.4 is a really great get. 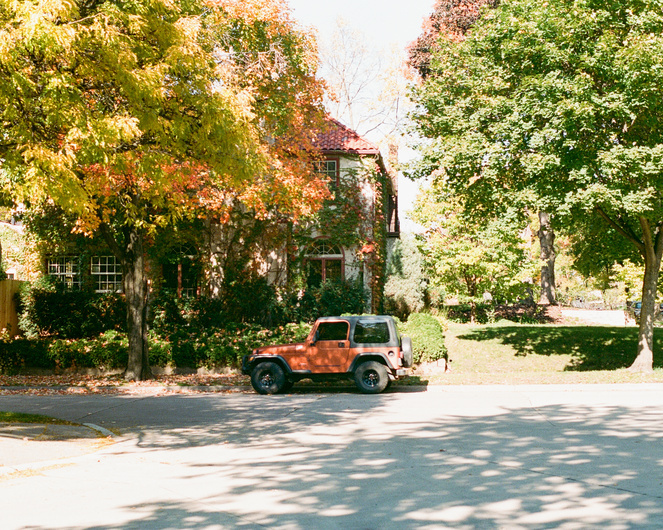 A well executed 50mm shot on an AE-1 Program takes little effort with great reward. As you know, the 50mm lens is about what the human eye sees, so spotting a great shot and executing the photograph comes pretty smooth. There is an f/1.4 and a cheaper f/1.8 available, with the greater reviews going towards the f/1.4. The 85mm lens available shoots at f/1.2, and still runs pretty pricey for one in good shape. A little digging with reveal and range of wider angles, a fisheye, and a bunch of telephotos, however the 50mm on this camera is the winning combination. A slight pull up on the rewind crank pops the film door open from left to right. Simple and straightforward, the film compartment is located on the left with a dual stage take up spool on the right. Feed the leader into the slots on the take up spool and advance. The stock manual advance crank is required to send the film into place with a dial located on the top right to signify the amount of exposures captured. Opening the film door will always send the dial back to “S” or start. To rewind the film, press the small black button on the bottom right of the camera to release the take up spool, pop up the rewind crank, and turn clockwise. An optional attachable motor drive auto advances and rewinds the film automatically. This device uses the same technology and connecting points from the AE-1P’s predecessor, the A-1. Looking through the eyepiece, you will notice a meter on the right side of mirror display. 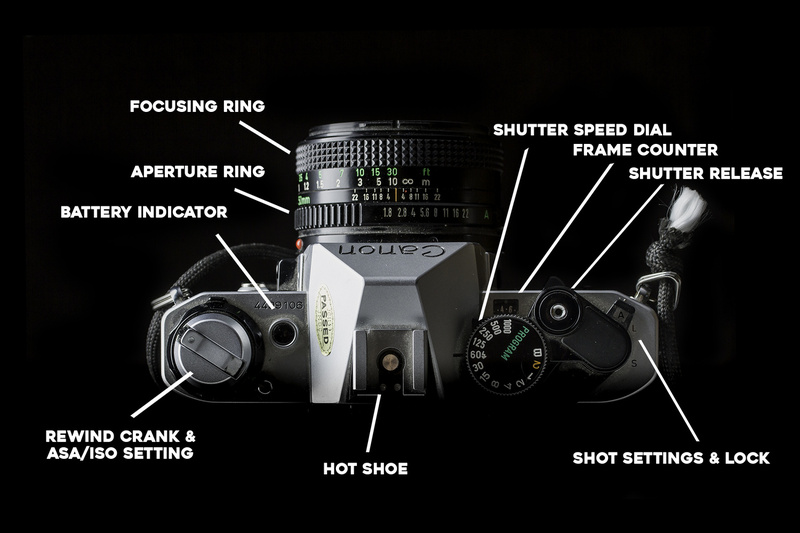 The numbers indicate the proper aperture to take an accurately exposed image. The metering was groundbreaking for its time, incorporating full aperture, counterweighted, averaging metering (also known as TTL stopped-down metering). The meter is also rated to work on film speeds from ISO 12–3,200. All together, it’s a beauty of engineering packed into a sleek package. There's a pretty easy hack for a double exposure on this camera. Achieving a double exposure on most film cameras requires a few steps at the very minimum. On the AE-1 Program, you can simple click the little black button on the bottom of the camera that you'd click to rewind the film. This will release the take up spool. Put your thumb on the rewind crank to prevent it from moving and advance the film. Now you'll be ready for your second exposure and continue advancing as normal. Repeat these steps for each additional exposure per frame. Overall, for the price, this camera is worth every cent. It is a must-own camera for every photographer, if anything for its historical significance. The functionality is efficient, the look and feel is unmistakeable, and the price is reasonable. You can easily pick one up on eBay for under $100, load it up with your favorite film, and let the nostalgia wash over you. My recommendation is to not take the camera super serious. Sure, you’ll find photographers out there producing some very technical imagery using this camera, but to me, the beauty rests in its companionship. Having the AE-1 always with you allows you to snap some beautiful candids from the hip but don’t expect it to deliver in a paid professional setting. The manual advance slows things down (though an auto advance attachment is available), and the lens (specifically the 50mm f/1.8) gets very soft around the edges when shooting faster than f/4. 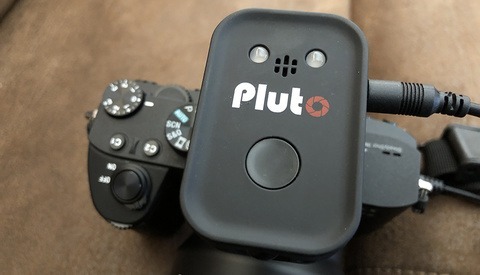 I must confess, I'm very biased in my review of this camera. This model was my gateway to photography when I was a child. We had our family's AE-1 Program, complete with woven strap, on the top shelf of the hall closet ready for every family event. Oftentimes, no one would want to have the responsibility of documenting our ridiculous adventures so the duty would fall to me. My earliest memories often consist of cranking the advance lever, the satisfying feel of gears turning, the metal clanking and the film moving inside of this solid metal body. The AE-1 Program, and many of the Canon A-series cameras, have similar nostalgia to film shooters; whether their first film school camera, a family heirloom, or a gateway back into shooting film, the AE-1 marks a beginning in a lot of ways. Just as it ushered in new technology, it very much still exists as a reference point in the evolution of photographic technology. Is there a camera that speaks to your childhood or beginnings as a photographer? What is it and why? I’d love to review it. Pentax K1000 - no one at my '80's era junior high school newspaper wanted to take pics, so when I expressed an interest they gave me the camera, all the film I could shoot, and a darkroom. Great camera. I joined the student newspaper in college in the 80's. Being one of a handful of people with an AE-1 Program, I too got all the film I could shoot and a darkroom to work in. Great times! I've still got one of these somewhere in the house. It was my first SLR. I remember the days when Aperture Priority and Shutter Priority were an either or prospect. You didn't get both. At least not on Canon and Minolta. For me the it was the Monolta SRT-101, a tank of a camera but with the focus ring in the viewfinder I could focus properly, eyeglass wearer talking. I loved the photos from it and it seemed I just couldn't take a bad photo with it. By that I mean no lost shots. I won't mention inexperience or bad composition. Nikkormat FTN for me. Great starter camera, although it had a few quirks (including an ASA selector that bent your fingernails back and a reversed light meter reading) but I love the shutter speed selector placement. Plus it was built like a damned tank. They can go for 50 bucks on eBay now, with a lens. Nice introduction. I never dabbled with the Canon FD mount system (EOS is a different story), and use the whole range of Nikon film bodies for my film fun, but, nonetheless, maybe one day I will. It is a beautiful camera. Canon FTb-n with an FD 50 1.4 was my first SLR and remains my sentimental favorite. I also had a few AE1's and the AE1 Program. But, my memory of Canon in the late 70's differs from the one suggested in the article. Canon broke new ground with the intorduction of the F1 and a complete system including backs, viewfinders, and "auto stop down aperture" FD lenses just in time for the 1972 Olympics. They introduced the fully internal lens linkage with the body and the breech mount lens mount. Canon was nippin at Nikon's heels and quickly became popular at institutions who were not already invested in Nikon. Also, the AE1 Program sold for less than $300, not the $700 suggested above. The top-of-the-line F1 and A-1 were in the $400-500 range. 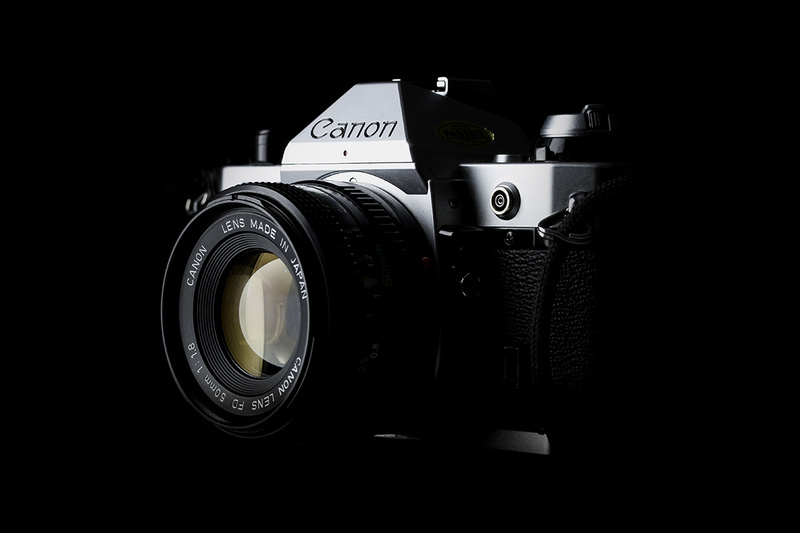 Canon was more than a "consumer" company, but the AE1 did helped them leap frog ahead of the pack in the "consumer" market. Agreed, I'm being subjective in my recollection. In 1974 I paid $299 for the FTb-n with the 50mm 1.4. This has stuck in my mind because I did odd jobs for $1 an hour to earn it. A few years later, I worked at Target and sold the AE-1 and AE-1 Program and neither approached $700. But, Canon's MSRP may have been much higher then. They didn't hold retailers to this pricing like they do now. I picked up a few refurbished AE-1 body's for $50 and used those extensively. Even though I used them in manual most of the time and rarely took advantage of the auto modes, these were great cameras. 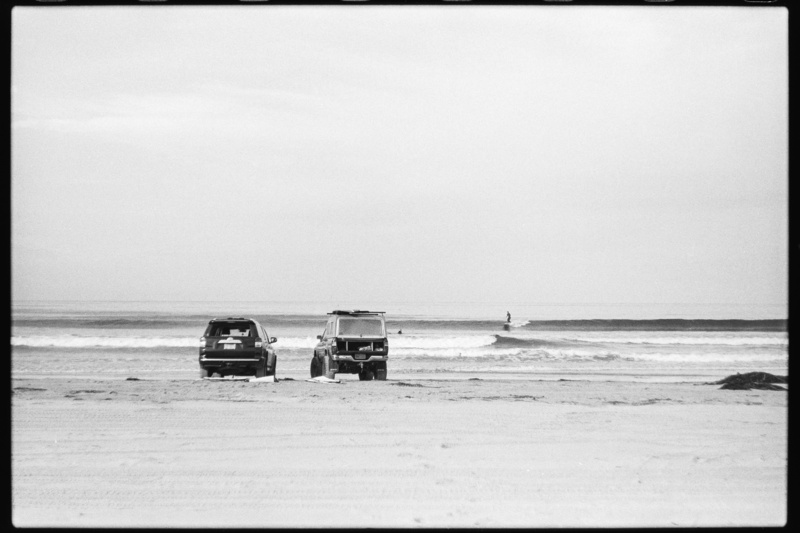 One big benefit over my beloved FTb-n was the electronically timed shutter in the AE-1's. The FTb-n sometimes needed periodic servicing to re-time the shutter. 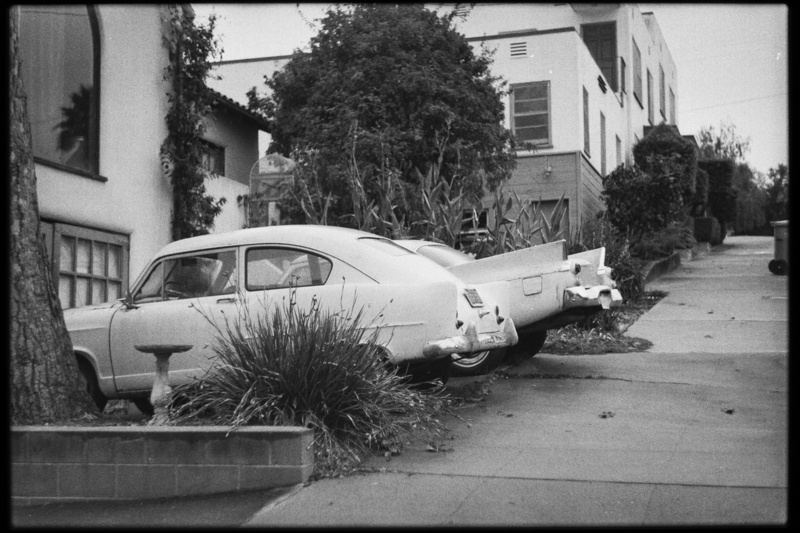 I think the AE-1 made great strides to bringing SLRs to the masses, much like the Digital Rebel XT did with the DSLRs. The AE-1 was not only reasonably priced, but also the cheapest Canon SLR to offer an auto-winder. At 0.5 seconds, it wasn't exactly burst mode, but it meant never needing to move the camera from your eye to advance the film. Strangely, I kind of miss advaning film with my thumb. Thanks for the trip down memory lane! I love how you relate it to the rebel... great point! I should have used that reference in my review. I have a Calumet catalog from March 1, 1982. The AE-1 Program sold for @ $300 as the A-1 was around $400. My fatter purchased his A-1 before I had saved enough to buy my AE-1 Program. The A-1 offered both shutter & aperture priority, as well as metered manual. & fully auto. The F-1 was already a solid professional’s camera. Although Nikon had a better rep as the pro’s choice Canon had a strong lineup with the F-1 recognized pro camera & the popular consumer cameras the A-1 & the AE-1 Program. What timing. I was moving my mom form NC to CO recently and had to clean out her house...in doing so I found my dads old AE-1 which is also the camera I learned on. Its sitting on my mantle now! So rad! Glad to hear it, dust that bad boy off! I'm originally from NC too. Colorado sounds like a fun move, good luck! I love my AE1-P! I got it for super cheap and traded in the FD 50mm 1.8 lens for the sharper 1.4. which came with multi coating that the 1.8 didn't. Waiting on some scans to come back any day now! Also, I cannot say enough how much I enjoy these Analog articles. Keep them coming please! That's rad! Would love to check some of those shots out. And thanks man, for the compliment! I'm gonna try to keep em coming, its a fun exercise... and even more fun to talk with people equally enthused about the format! It's niche but it's apparently growing in popularity again. I don't own a Canon AE-1P; but I got my start in photography with the A-1 in 1980, which I still own. In July 2013, I bought a used New F-1 since that was one of my bucket list cameras. Thats such a pretty camera! F1 = classic beauty. 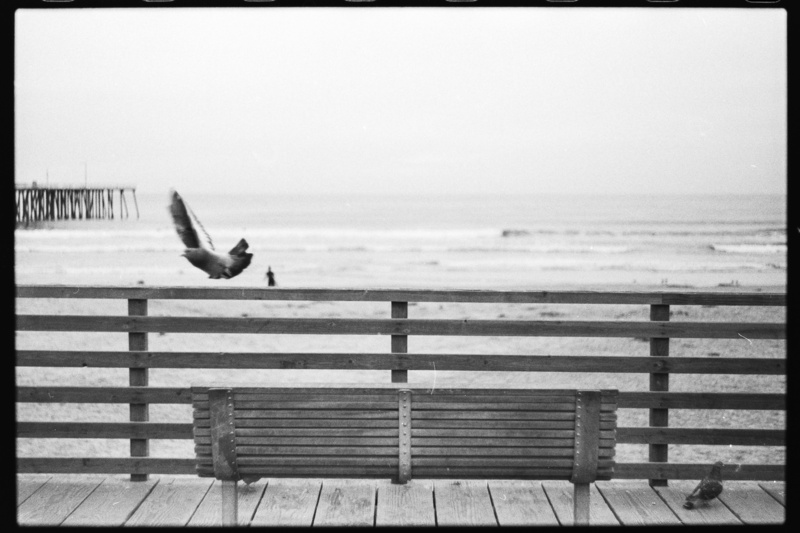 AE-1P is awesome! thanks of the double exposure hack. Now AE-1 vs the AE1-P? The sound of the shutter on the AE-1 is much nicer to me.. the Canonet QL17 (have you reviewed it?) was my 1st 35mm a few years ago and still is my #1 film camera to use. So true! The AE1’s shutter is so much more satisfying. The AE1p has this strange zip sound at slower speeds (hard to explain). It feels less solid, good point. I have actually been on the look out for a canonet ql17 to review. I love that camera! I go back about 15 years before the Canon AE-1, to 1964 and the Canon FX. It was my first "real" camera in high school, the one I learned about photography with. And I still use the Canon FX. In fact, I collect them. I have all of the Canon FL mount lenses, including the four "convertible" lenses: 400mm, 600mm, 800mm, and 1200mm. The convertible series has a focusing and control section, with a removeable headend for the desired focal length. The Canon FX was a clean, solid, easy to use, no frills camera. I'd like to see how many of the modern cameras fare after 50+ years. This was my first Camera also. Got it 20 years ago. Inherited it from my Grandfather. He got my Dad into photography. My Dad inspired me to. His work was great! I still have that camera. Got a lot of wonderful shots with it. Even captured an F-14 breaking the sound barrier. Thank you for this article. It really brought back so many memories.